I’ve never been an extrovert. I have, though, witnessed insensitivity toward the feelings and unpredictable responses of extroverted children who don’t have skin made of iron. Surprisingly, our extroverted USA culture seems better at making space for introverted children, especially girls. They’re fragile, too, but in a quiet, perhaps more predictable way? Or so it may seem on the outside. I don’t remember the circumstances of this photo. 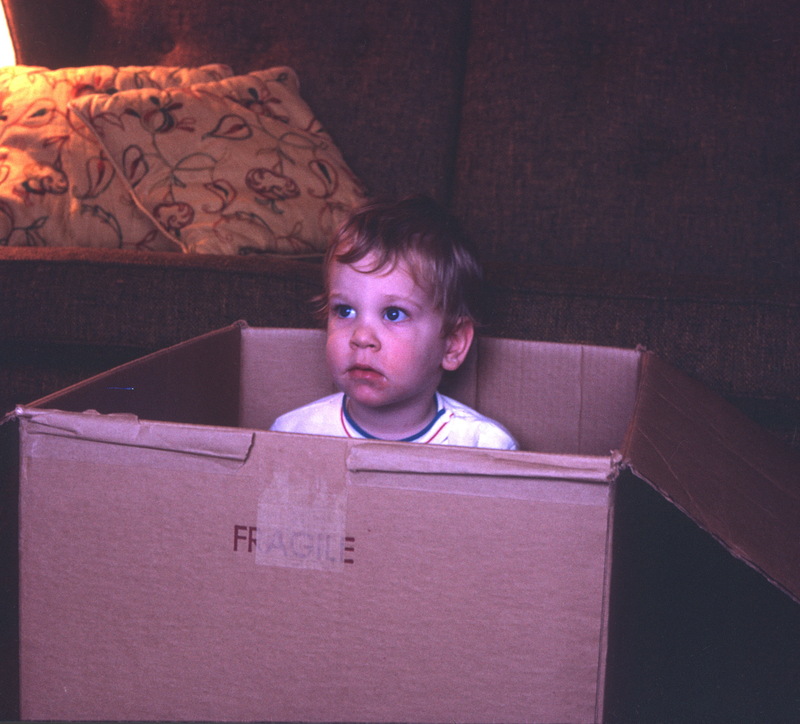 So I’m trying to imagine what our extroverted, sensitive Son is thinking, sitting there in his Big Bear box. I posted a photo of him opening it here. Maybe he wants to be wrapped up and shipped off to live with Grammy who sent him Big Bear. Or maybe he’s wondering why I just told him to stop making all that noise. That wasn’t noise! That was the music of my drum set! The one he just made in the living room out of my kitchen pots, pans and lids, using my wooden spoons as drumsticks. Or maybe he’s perplexed. Didn’t you just tell me to go outside and run off some energy? So why did you just tell me to come back inside because I’m being too noisy? And why do you always tell me to be quiet when you’re quiet? Isn’t that a good time to talk to you? There’s so much I want to show you and tell you about! I wasn’t trying to have an accident. I was just playing in our new car [with the automatic gear shift] when it started to roll backwards down the driveway! Why are you crying? I didn’t hurt anybody. Besides, I’ve watched you and Dad drive and I want to drive, too! Why do you keep asking me about the end of my story? You wanted me to say something onto the tape recorder, didn’t you? But now you think I’m just going on and on and on! That’s because I’m not done yet! I wasn’t banging on the piano! I was making up a song! Couldn’t you tell? Don’t you want to hear what it’s about? All I can say is I loved Son dearly, and yet…Sometimes I felt I’d woken up on another planet. When I was pregnant with him, my greatest fear was that I wouldn’t know what to do with a little boy. Boys were foreign to me. But once Son arrived, taking care of him was relatively easy when it came to food, clothes, and daily routines. Still, I wasn’t prepared for the extent of his energy, curiosity and willingness to take breathtaking risks. I’ll never forget the first time we visited a park with a firemen’s pole built into the playground equipment. He was 18 months old. Our only child at that point. Son didn’t miss a beat. He saw the pole. He climbed up to the take-off, reached out for the pole and let it fly! Flat onto the ground below, face first. He didn’t have a clue what to do with his legs and feet. It never occurred to him to wonder about that. He just wanted to slide down the pole. Yes, he survived. Not just that, but similar experiments that seemed to leap up into his face and dare him to just go right ahead and try. Though I had no brothers, my childhood was far from dull. Granted, it had a different kind of energy, excitement and creativity. No one would have described me as exuberant or extroverted. I wasn’t a stick in the mud as a mother. But I do have D to thank for showing me how to loosen up a bit. How to get down on the floor with our children, and scare ourselves silly playing ambush. Every child – boy or girl – scares the daylights out of their parents by doing all the same things their parents did before them. Hi, John. You may be right about that. Though I’m quite sure I never ever banged on a piano. Just thinking about the car rolling down the driveway backwards still scares the daylights out of me! Maybe I can come up with an equivalent in my childhood if I think about it long enough. It’s really too bad my parents aren’t around to jog my memory, don’t you think?